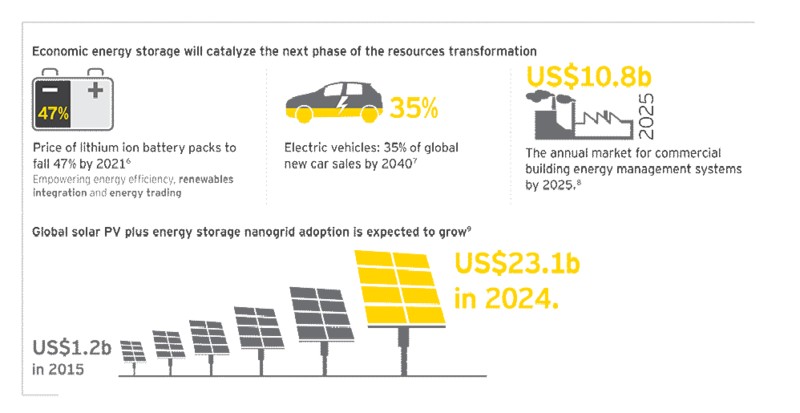 A convergence in energy, batteries, smart technology and transportation is driving the establishment of innovative, integrated and networked resource solutions with even broader potential disruption and upsides – the fourth industrial revolution in natural resources. As energy storage costs fall, new value streams and an increasing number of business models become economically compelling. Economical energy storage paves the way for upsides in renewable energy integration, energy trading, grid optimization and electric vehicles, all with the potential to disrupt incumbents. A growing number of conventional energy companies are embracing the need to participate in the low-carbon energy transition. Fresh impetus is being given to developing innovations in carbon capture, reuse and sequestration. Developed markets face a trillion-dollar investment gap in maintaining existing water infrastructure. Emerging markets contend with the fundamental challenge of meeting the needs of growing populations. 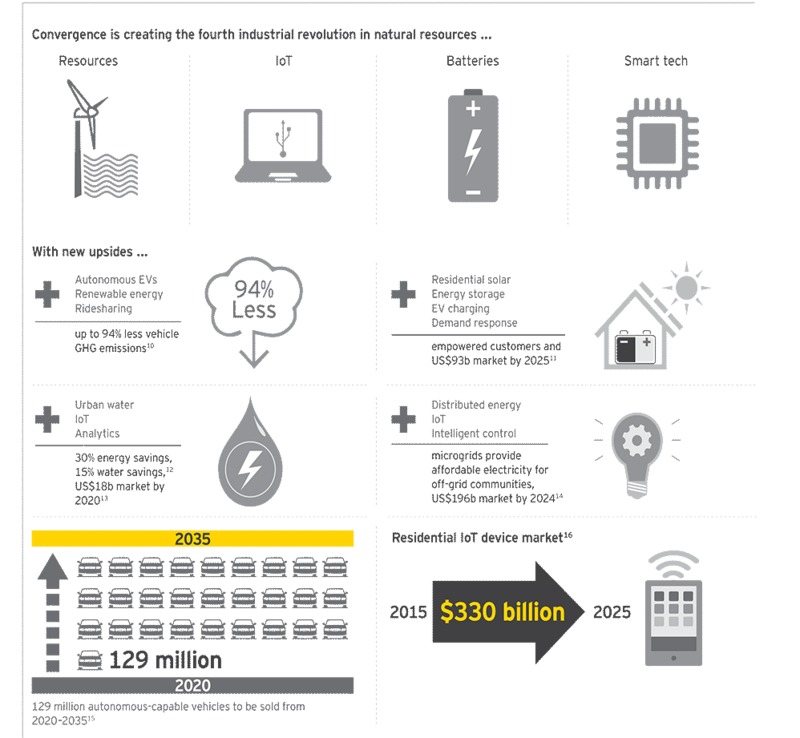 The crisis is spurring innovation and adoption, including sensors, smart meters, modular water treatment systems and more. Emerging market countries have embraced renewables and nuclear energy as part of an “all of the above” strategy to meet growing energy needs. Lack of a centralized resources infrastructure in many regions is leading to the adoption of distributed resource innovations. Distributed resource innovations could have a transformative impact for the billion people without access to power and clean water. Remaking how the world produces and consumes resources such as energy and water will require mobilizing vast amounts of capital, replacing incumbent systems and spurring innovation. Inherent in this process are disruptions and upsides that will reshape industries. Could innovation make the planet resource rich, rather than resource scarce? http://news.mit.edu/2014/predicting-the-future-of-global-water-stress, accessed 1 April 16. BP Energy Outlook: 2016 Edition, BP, p. 15.
http://www.environmentalleader.com/2015/12/15/cop21-climate-deal-whats-next-for-business/#ixzz44obQS1DZ, accessed 4 April 16. Market Data: Advanced Batteries for Utility-Scale Energy Storage, Navigant Research, 1Q 2016, p. 12.
http://www.nature.com/articles/nclimate2685.epdf?referrer_access_token=3hSNyD6aveKmcqROPSlUadRgN0jAjWel9jnR3ZoTv0OgWH88gW1xBh-ptYSEqpmrDtpqP4OzfAkwuSL, accessed 4 April 16.
http://www.waterworld.com/articles/print/volume-29/issue-12/water-utility-management/smart-water-a-key-building-block-of-the-smart-city-of-the-future.html, accessed 4 April 16.